MavenHut is growing. Faster than expected, actually. As a consequence, we are bringing more people on board (adding to the 22 already in the office). And one or more of themshould be an iOS developer 🙂 So, if you are an iOS developer and you want to program fun games, played by millions of users around the world, you want to experience a SiliconValley like startup life, but closer to home (our dev HQ is in Bucharest), you should give us a nudge (mail to office AT mavenhut.com ). 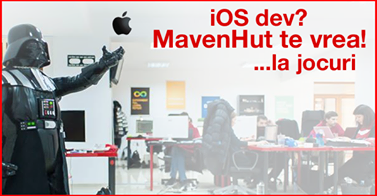 If you are interested, fire an email to office AT mavenhut.com. Abia astept sa va vad si pe iOS ;)! Sunt mandru de voi! Felicitari! Wow, v-ati miscat extraordinar de rapid :D, acum am vazut ca sunteti pe App Store din noiembrie 2013! Scuze, am vrut sa zic ca din octombrie 2013 :)!